Well, what this really is, is a tomato and carrot soup with packaged coconut milk added in towards the end of the cooking process. The result is a delicious variation on an otherwise regular sort of vegetable soup in our home. The girls loved it when I served it for dinner yesterday, so I was glad for the impulse that had made me reach for the pack of coconut milk and pour it in while the soup simmered. The following quantities made enough soup for two meals for the 4 of us. I had a small chunk of pumpkin, two carrots, half a red bell pepper, a leek and five and a half tomatoes left over in the fridge from last week’s shopping at Carrefour. So I have made soup for tonight’s dinner with all of that (and there will be enough left over for tomorrow as well, with these quantities) ,with the addition of fresh basil leaves that I went out and got this morning from the “Primeur de Fruits” in Tournamy. 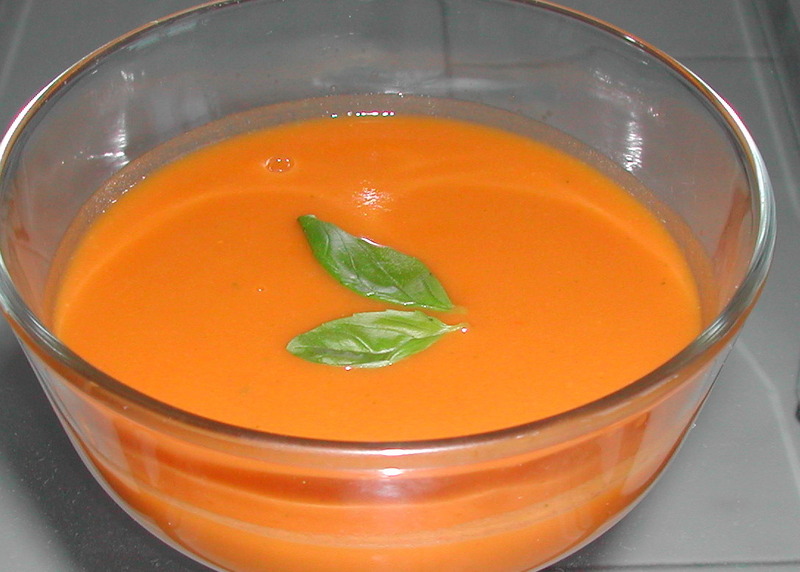 The method is the same as for the tomato and basil soup. Pizza and soup with basil, anyone? That’ll be two “Oh Yay !! !”s for sure. I tend to eat this daal (yellow split peas) from a bowl like one would eat soup, with a touch of lime juice though it very nice with phulkas or paranthas too. It has a really hearty taste and is quite filling. My Ma usually tempers it with paanchphoran, which somehow suits this daal, IMO. She often cooks it with bottle gourd (lauki) added to it, which I substitute with courgette since that Indian vegetable is not easy to find here. And though I made it yesterday with the skin of the courgette peeled off, since the girls eat it more easily that way, it is probably better to retain the skin since that likely has a lot of nutrients. I also usually make more of this daal than we need for one meal because the leftover portion, mixed with whole wheat flour, makes the dough for really soft and full-of-taste phulkas/paranthas the next day. Soak the lentils for a couple of hours, then drain the water in which they were soaked and pressure cook with another three cups of water and salt till quite soft. This will probably need 6 to 8 whistles (if the pressure cooker is the Indian variety). Remove the cooker off the hob and when all the steam has been released from the cooker, open the lid, stir the daal with a large spoon or ladle to break up the grains, then add the courgette and cook the mixture again -another couple of whistles should do it. When the cooker is ready to be opened again add the turmeric and stir everything together gently so as not to smash the courgette pieces. In the meanwhile, in a smaller frying pan, prepare the tadka. Heat the oil, then add paanchphoron. As all the five spices of paanchphoron begin to crackle, add the onions and fry till they are golden brown. Add the ginger paste/grated ginger next and fry for another 30 seconds, then add the tomatoes and fry till the oil starts to appear on the sides. Now add the chopped coriander and mix everything well before adding this tadka to the daal in the cooker. If the daal seems too thick then add a little boiled water (and salt, if needed). 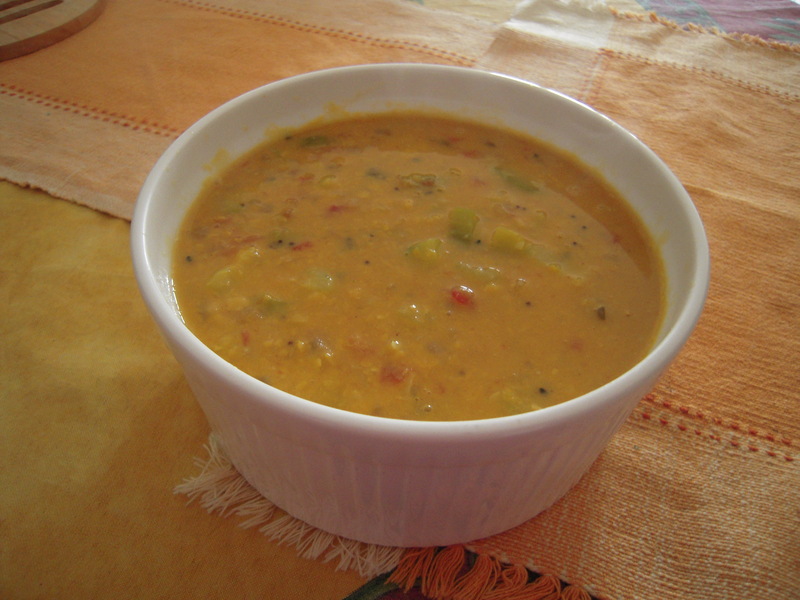 To finish, simmer the daal for a few minutes so that the tadka blends in well. I am making this again for dinner tonight, as I find that sweet potato works well with broccoli. The recipe is the same as for the pumpkin and broccoli soup. Just replace the pumpkin with 1 large sweet potato, peeled and chopped fine. This is very nice too. I am going to make some simple scrambled eggs with this , the way I saw Nanda’s Ma make them once when Indira and I visited them in Amsterdam many years ago. When we arrived at our friend Jenny’s home for lunch one Sunday not long ago, I saw that she had made broccoli and Stilton cheese soup to serve as a first course to the parents. It struck me then that all this time as I have tried to introduce broccoli to my family’s diet – unsuccessfully, as none of us have managed to develop a taste for it -I have never considered adding broccoli to soup. I usually just steam it to add to either salads or pasta and once in desperation even cooked it as a subzi ( the way one makes cauliflower in India) after I ate it in this form at my sister-in-law’s home. All those attempts having failed to endear this vegetable to us, I had resigned myself to the fact that this is one healthy vegetable our family would have to do without. But soup with broccoli seemed like an intriguing new idea so I requested that Jenny serve some to the children too, as I wanted to see if my girls would take to this vegetable better in this form. As it turned out, the girls didn’t exactly love it. They finished it mainly because I told them it would be impolite not to do so. But, significantly, they did not turn up their noses at it completely either, which encouraged me to think that I could probably get away with blending broccoli in to soup too, camouflaged among other vegetables. So that is what I have done more than once since that Sunday, and the soup I made for dinner yesterday was the nicest of those recent attempts. The girls actually said that they liked it, until I spoilt it somewhat by telling them, feeling rather smug, that one of the vegetables in the soup was broccoli. Indira immediately started to look like she wasn’t pleased at being duped, and said, “So that’s what those tiny green bits are !” in a somewhat vexed voice. But I do believe they’ll eat it readily enough again; they did like it sufficiently until the moment of truth. 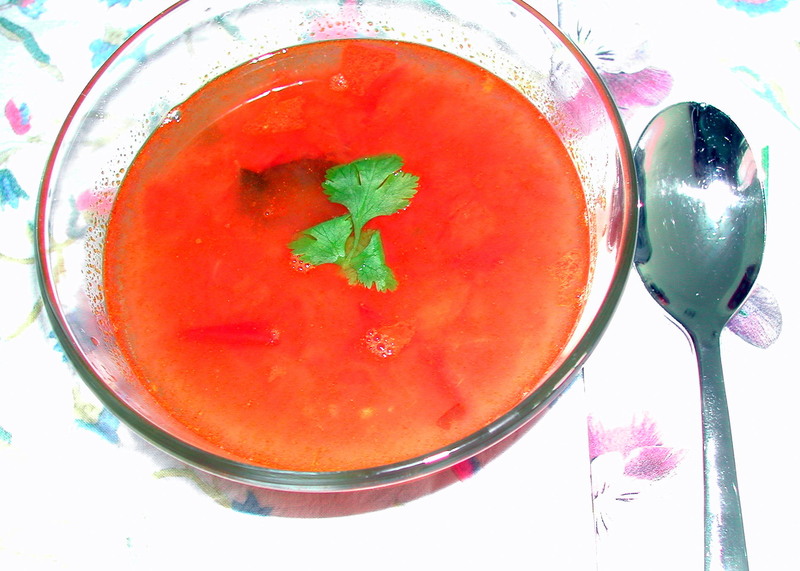 The recipe is much the same as for Indira’s favorite vegetable soup, except that here I replace the red pepper with broccoli. Separate the broccoli’s florets, then cut these in to smaller pieces. Discard the hard part of the leek, and finely chop the rest, after washing it carefully. Chop the garlic too. In a pressure-cooker, warm the oil on a low heat and then add the leek and garlic. Sweat these down gently for 4-5 minutes, making sure not to let them brown or burn. Next, add the pumpkin and the broccoli, cover the cooker, and cook everything together for some time, turning frequently, till the vegetables start to glisten and look soft. Then add the tomatoes and cook till the tomatoes start to break down. Add the salt, about 500ml of water, and pressure-cook the vegetables till they are quite soft. Blend the mixture, adding some boiled water if the soup seems too thick. Stir in a little unrefined brown sugar ( I added about 1 1/2-2 tsps) if the soup tastes too tart on account of the tomatoes. A little touch of cream in each bowl is nice, too. This home made answer to what restaurants call mulligatawny soup went down very well with our guests on Saturday. Soak the daal for 1-2 hours, then pressure cook it till it is very soft. In a large casserole, warm the ghee, and add the mustard seeds. When these begin to crackle, add the curry leaves and the asafoetida. Fry these for just a few seconds, add the ginger, and fry till for a few seconds till it starts to turn a golden color. Now add the tomatoes and the turmeric, and fry for a couple of minutes. Add the salt and 2 cups of water next, and let the mixture come to a boil. Continue cooking for 7-8 minutes, mix in the daal, and simmer everything together for a further 10-12 minutes or until the soup has acquired the thickness/consistency you’d like. Stir in ½ the coriander and turn the heat off, keeping the rest to add a little to each bowl before you eat. For a spicier flavour, grind pepper on to each portion. It definitely lifts the taste; gives it a great kick that goes well with the tanginess of the tomatoes. We had soup for dinner this evening, because Noor has developed a cold. I had picked up a large bunch of fresh basil yesterday because I wanted to use some for the soup today; they say this herb is beneficial when one has a cold. In a pressure cooker or a large casserole, warm the olive oil on a low heat and add the leek and garlic. Cover and cook till the leek is soft. Add the carrots if you are using them, cover again and cook for 6-7 minutes. Add the tomatoes and the salt, and cook till the tomatoes start to break down. Add 2-3 cups of water, and cook everything together till all the vegetables are very soft. When the contents of the cooker/casserole have cooled a little bit, add the basil leaves and blend everything together. Strain the soup through a sieve. If the soup seems too thick, add some boiled water and then let the soup simmer again for a few minutes. You could add the basil a little bit at a time while blending the vegetables; this way you could decide how much of its flavor you are happy with.